Ok, now that all this Carnival craziness is over, let me explain to you what is this Goods for Girls thing on my sidebar in honor of International Women’s Day. In all her crunchy glory, this chick manages to help girls in need and stick it to the man, in this case, Procter & Gamble. Yes, because P&G has been quick to jump into the charity business of creating new markets for their plastic shite tampons and pads. Hence you are kindly requested to donate new (duh!) reusable pads for this project, either by making them yourself or buying them online. And please consider donating waterproof carrying bags, because I would expect there might be a shortage of them. Oh, and to save you the trouble, I already determined that the cheapest pads are here (3$). So happy Women’s Day! Now get! Photo by Hedwig. And that’s not really our garden, its common space. And that’s not really my house either. And the stage was for a party. So, remember a while back I told you guys I was moving out of my apartment? I even promised to tell you more about my new place… Yeah, I know I also hinted that my posting might become more regular, and we’ve seen how that turned out 😀 Well, here I am, keeping yet another overdue promise. After more than a year cohabitating with ClosetBoyfriend, I’m back to living in student housing for a few months. And, believe it or not, its actually been a step forward in terms of greenness. All because I was lucky enough to end up in a house where everyone was already pretty green by my own standards, in a wonderful place called Droevendaal. The house itself is a sort of a bungalow with a garden, in a little student complex of sorts. The toilets and washing machine use rainwater, and we use green electricity. But probably the main factor that makes us green is the strong communal component in our house. We eat together everyday and all the food is shared. Oh, and there is a strict vegetarian policy, which accounts for the fact that I only ate meat one time since I’ve lived here (at that conference). And this probably has something to do with the fact that our 6 person household only uses around 4200 KWh per year. Compared to 4600 KWh of the average European household and 11.200 KWh of the average American household (note that the average household typically consists of 3 or 4 people). We have a compost bin in the garden, and though we don’t have anything growing right now, we still have a sizable stash of homemade jam in the pantry from this summer’s berries. But I have to say, my favorite thing is that, for the most part, my housemates are pretty committed to eating organic and that’s just such a relief I don’t have to persuade them, or, alternatively, always do the shopping myself. We also have 2 house cats that satisfy my cat-loving needs. One of them is really old and I swear, he’s the ugliest little feline creature I have ever seen. The other one is cute and slutty and likes to hang out in my room. Would be cuter if it wasn’t for the daily dead mouse in our kitchen. I lovingly refer to them as ‘the ugly one’ and ‘the slutty one’. So there you have it, my new house. I quite like it here and that goes a long way towards enduring the absence of ClosetBoyfriend. Ps: I think I’ll still add a some pictures to this post, so if you want to see just how ugly the ‘ugly one’ is, check back later this week. Ok, so in case you haven’t read my first post, and don’t know this about me, I am an environmental engineer (well, sort of). I would be an environmental engineer by now if I hadn’t came to Wageningen to get a Masters degree, or if the Portuguese were like normal people and didn’t have 5 year degrees unlike the rest of the world… but never mind, I digress. Anyway, I’ve had my share of Waste Management throughout all this. I’m not claiming to be an expert, I didn’t read ‘Garbage Land’ but I do know about trash (in fact I have an unhealthy obsession with trash, even my thesis is about trash). So anyway, I thought it was about time that I shared my bottomless pit of trash knowledge with the world, and maybe inform some peeps on all those things “they” don’t tell you. 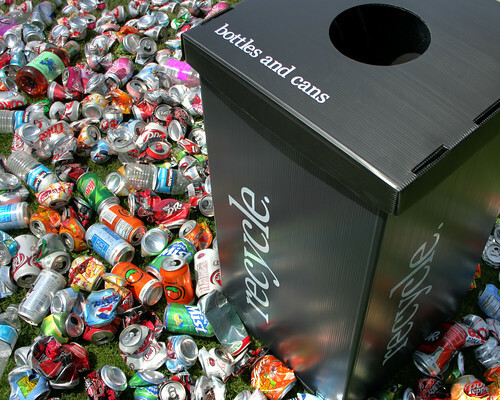 If you are still reading this far and think that recycling your cans and bottles is a big sacrifice, read no further. This post will only confuse and demotivate you. But if you want to recycle EVERYTHING you possibly can, this post is for you. Now, here is what you must know about how recycling systems work: 1) there is a LOT that they don’t tell you. The reason is, they don’t want to confuse you and demotivate you from recycling. It’s for your own good, really 2) recycling materials, most of the times, are sorted by cranky, busy and underpaid employees (think Ten Worst Jobs in America). If something is not up to standard, it is rejected. No one is going to wash the plastic cup you didn’t wash. Best case, they will just reject the peanut butter jar. Worst case- they will assume the whole lot is contaminated and landfill it all. Of course, recycling depends very much the place you live, so my first recommendation is to check with your local recycling system and see what they do and don’t recycle. There is no point in separating all your plastic if it’s not accepted. This will most likely result in a whole batch of perfectly good recyclables getting send to landfill because recycling collectors will assume the whole container is contaminated. This WILL happen, for example, if they see a food-soaked item in a cardboard recycling bin , like a pizza box. No one is going to go through a container and separate the ‘clean’ from the ‘dirty’. And if it doesn’t get rejected right away, it will force a recycling worker to go handle rotting food on the sorting table by HAND. Glass bottles from olive oil, for example, are ok too, as well as sardine cans and things like that. Only glass bottles and jars can be recycled. You can’t recycle light bulbs (not CFL), ceramics, Pyrex, kitchen glassware like glasses and plates, white skin cream jars. These types of glass have different melting temperatures than regular glass and form solid inclusions in the final product . Do NOT recycle pizza boxes!!! Even IF the pizza box IS clean, they will still assume it’s dirty and toss it just the same, and possibly the whole container as well! Treehuggers, enviro-freaks, you don’t want to risk that, do you? Waxed, composit or laminated paper is generally not allowed, like milk cartons, fast food wraps, drink boxes. Note: Some places accept drink cartons, but I wouldn’t recycle it if it means getting milk all over clean paper and ruining it for recycling. I cannot emphasize enough that if that happens everything will get tossed! Flatten cardboard boxes – again, if they are not flattened, they can be rejected . #3, 4, 5 and 6 can be recyclable, even though it’s expensive and/or complicated, so avoid buying these if possible. #7 has virtually no recycling potential  so avoid this one like the plague. And of course, don’t bother recycling it. Always remove the bottle caps and toss them. They are a different plastic than the bottle and most of the times are not marked. Don’t even bother washing plastic if it’s been in contact with grease. You are wasting water on something that will be rejected anyway. Let me explain, even if you do get that peanut butter jar sparkling clean, because everyone else doesn’t, they will assume it’s greasy and toss it. If it’s been in contact with non-grease liquids or food, give it a little rinse. But a little bit of soda residue is fine. “When in doubt, throw it out”. I think a common mistake is ‘when in doubt, recycle’, which often leads to more harm then good. Don’t bother recycling small pieces of paper and plastic. Normally, grading is one of the first stages in recycling plants, all the small bits and pieces are sifted out and trashed. Are you still with me, brave reader? I hope I didn’t overwhelm you too much… Don’t hesitate to speak up if you have any questions, doubts or comments! Photo Courtesy of Kingdesmond1337 on Flickr. Edit: I am actually now in the process of reading Garbage Land. So far it confirms everything I’ve said. Any guys out there? Er… Move along now! Nothing to see here… Don’t say you have not been warned. Continue at YOUR OWN RISK!!! Anyway… Girls (I hope!). This is a Diva Cup… Although I suspect that the only people who read this blog already know that, and are way ahead of me on this, but in case you don’t… This here is a pretty accurate depiction of a Diva Cup. If you still don’t know what it is or what it’s for, you can click on this link and learn all about it. Clue: it’s not kitchenware. Fellow blogger Crunchy Chicken is hosting a neat little Diva Cup Challange over at her blog, with prizes and all, how cool is that. The challenge consists of trying the cup for 3 months and, hopefully, swear off disposables for life. I realized now I screwed up promoting it, it was only possible to sign up until April 30. Oops. I ordered mine from here at a really discounted price, and received it yesterday. Just it time to try it out before my time of the month is over. How is it? It’s GREAT!!! I was kind of skeptical at first, how could you NOT feel that, it’s huuuge! But I guess the Diva worshipers out there were right… It IS the greatest thing since the wheel. Really. TMI follows, look away NOW! I have to say, at first the stem was bothering me but then I trimmed it and now it’s perfect. Don’t even know it’s there. And I am still having a little trouble getting it in and out but I know I will get better with practice… OK, TMI over. It’s so much cheaper. By my calculations, it should have paid for itself after six months. The knowledge that I am never throwing away another crappy disposable is priceless. So if you are still reading this,I hope I didn’t totally gross you out (too much). GO order it NOW! Really… you will not regret it. And if by chance you are a morbidly curious guy still reading this, you can take the opportunity to inform your Woman (or surprise her :D). Ok… this was the most embarrassing post I’ve written so far. The end. …. is an organic peach! I have to admit that I am quite ignorant about what can befal you from eating pesticides for breakfast lunch and dinner, but I can guess that none of it is good things. There is the age old portuguese addagio that goes ‘What doesn’t kill you makes you fat’ (maybe that’s where the ‘stronger’ comes from). Whether or not pesticides will make you fat (if they don’t kill you) is another matter, but my personal belief is that they might make you infertile and/or stupid and/or cancerous. Whatever the case may be, I know that I don’t want them messing with my hormones and that’s final. Anyhow, if you can’t afford to pledge pesticides out of your life, the Environmental Working Group has an great guide to know what you should absolutely stay clear of. The Dirty Dozen consists of, according to gravity of offense. Good news: Now I know I wasn’t buying peppers at 8 euros a kilo for nothing. I have been buying organic apples (phew!). 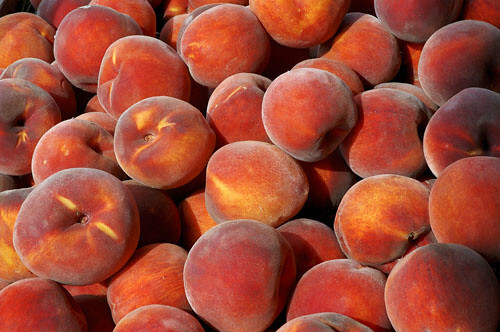 No peaches yet (phew!). Apples, pears, and potatoes are reasonably priced. I’m growing my own salad greens, which are just about getting ready. No more toxic lettuce for me! Bad news: Didn’t see any organic strawberries yet (those little back-stabbers). Leading the Cleaner 12 list we have onions, avocados, frozen sweet corn, pineapples, mango and asparagus, among others. Broccoli and cabbage are on this list too. So, if you are short on cash, you know you can easily dispense the organic onions or broccoli. Personally, my choice still goes for organic, for anything from cabbage up… But now at least I know its relatively safe to eat broccoli if need be. Good peaches, courtesy of rayvaughn on Flickr. Here is a picture of my groceries from my latest shopping trip. This is what you can buy for E 16,50 at the organic shop in Wageningen. 1L of full-fat, very yummy yogurt. The glass bottle is reusable and has a 25ct deposit to make sure it makes it back to the store. 500g of sunflower seeds. I’m a sucker for roasted sunflower seeds. Also good in salads. I was shocked to find that the organic bag’o’seeds is several times cheaper than the regular, non-organic seeds I used to buy at the market. Goes to prove organic is not always more expensive. 250g of sesame seeds. For some reason I thought that I could make hummus with sesame seeds… Apparently what I needed was ‘tahine’. Whatever… I think those must be good in sandwiches, salads and sauces. 1 bell pepper, paid it’s weight in gold for it. 1 plain dutch cheese. Pretty tasty. 1 certified sustainable smoked mackerel. Tasty by itself, but better in a fish dip/salad. My orange Slow Foods shopping tote. Very handy and cute as well. I also have a couple of other, not so cute bags. Lately, I have been shopping almost exclusively at this shop. I still have to start buying bread there as well. Sometimes I cheat by going to the supermarket across the street, and buy bread and other emergency items. I am buying meat exclusively from the Nature Slagerij (the organic butcher). For eggs, I only buy them at the organic stalls at the market, because it’s the only place I can reuse my egg carton. Sometimes I also buy veggies at the market. There is one stand that sells stuff from their own farm just across the river. They invited me for the inauguration of their farm-shop next weekend but I’m not sure if it’s close enough to bike there… maybe it’s worth the ride. We’ll see. I’m trying to avoid shopping at chain supermarkets, I don’t want my Euros fattening up their corporate @$$ess, but sometimes cheapness and convenience still gets the better of me. But I’m going there less and less, and when I do, I’m also buying a lot less stuff. I think I can ‘just say NO’ pretty soon, though. It is funny how every time we make any changes to our lives, we always antecipate all the worstcase scenarions, set-backs and problems. Most of the time, we envision changes to be harder than they actually turn out to be. But the fact is, sometimes, it doesn’t take a super-human effort to make a change, and after you have made up your mind, and are set on a certain course, things just kinda come together naturally. This is what I sort of realized this weekend. We decided to spend our Saturday in Utrecht, a real city, for a change. And without putting much thought or effort into it, ended up going to a nice organic restaurant that caught my eye in the New York Times. They change their menu every month and deliberately include seasonal products in it, which I presume must be local, for the most part. And of course, all their ingredients are organic. So despite the fact that we failed miserably in what was our objective for the day – shopping – we had a great time. And in the end it was quite a ‘sustainable’ day out, which came as a surprise even to me. Especially when our consumerist impulses were done away with. Photo courtesy of my love. Patrick on Where is Organic Leather? Vilhelm on Where is Organic Leather? plastic garbage bags on Let there be Compost! Eating Well Organically Tanned Leather « Recipes for Health on Where is Organic Leather?